Ah, Laurie Strode. A woman who has suffered a wide variety of indignity across her various iterations but somehow always come out better than anyone else on All Hallows Eve. It would seem we’re now, along with Jamie Lee Curtis, locked into a regular twenty year sequel reset of the franchise. Having loved the original (obviously) and the H20 (H Twenty surely, why would it be H2 0??) sequel in 1998, I was very much up for approaching this one with glee, rather than tired, cynical eyes. I’m pretty sure that it just about deserves that glee. Just. So, jettisoning every Halloween sequel since the original (well, not specifically 3 as that has no relation to any of this), including the H20 sequel ignorer, this one paints Laurie (JLC gamely returning and once again giving this whole franchise a reason for existing) as a prepper who has bulldozed her entire life in the pursuit of preparing, nay praying, for the day The Shape comes home. In some ways, aside from all the story bits, it does remain faithful to H20 in terms of Laurie’s inability to deal with the events that happened way back in ’78. But that’s pretty much all. Whereas H20 at least gave her something to be living for beyond her and her family’s survival, in a way very in keeping with the times, here she has nothing to live for beyond saving her daughter and granddaughter. It’s a bleak existence if you stopped to think about it but this movie isn’t too worried about such ‘thinking’. Beginning with the prefect Michael bait of a couple of true crime podcasters arriving in Illinois to interview him at the mental institution he has lived in since the murders, it’s not long before the mask is brought out, dogs are barking, patients howling and, wouldn’t you know it, Michael is on for a nice escapey bus ride to another facility. Meanwhile, Laurie is blowing the heads of manikins in her backyard, attempting to bond with her granddaughter and constantly embarrassing her daughter with her hysterical warnings. Oh, and there’s a new Dr Loomis. Literally addressed as such by Laurie as she eyes him up with suspicion. The script writers and the director you see are well and truly in on the gag, albeit an affectionate knowing gag rather than a cynical sneering gag. Scripted by David Gordon Green (also directing), Danny McBride and Jeff Fradley the script has all the marks you would expect from fanboys. Painstakingly updated and with some genuinely funny throwback lines referring to the fairly minimal nature (at least in today’s horrific terms) of Michael’s original killing spree, the script manages to mock and revere its subject at the same time. Even to the point of ageing the mask that the now 61 year old Myers wears. None of this would make any difference of course if the movie didn’t whizz along with the requisite number of scares and grisly murders. It scores higher on the latter than the former to be honest. 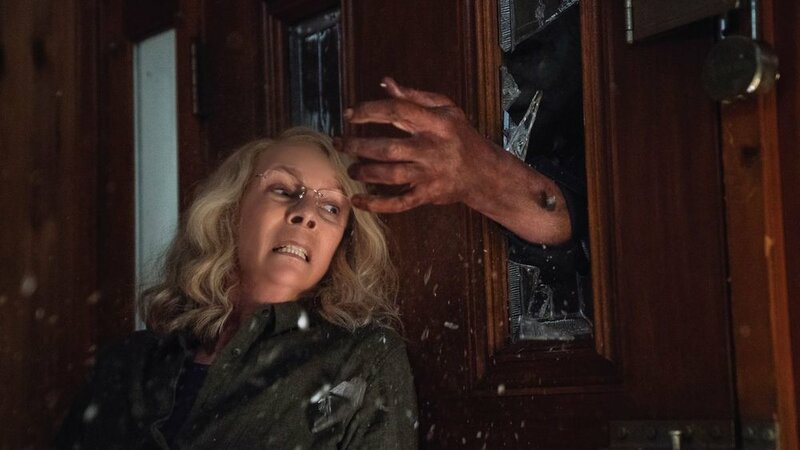 The scares are limited and, if you’ve seen the trailer, will likely all be spoiled by the time you take your seat but, like Michael himself, the movie has its own momentum. At a relatively chipper 106 minutes, there is little time to get bored here and the director does take the time at the beginning to introduce a reasonable amount of dread before the bus takes a dive and The Shape is once again released on the residents of Haddonfield. Who by now you suspect would be looking to pay Strode to live literally anywhere else in the country. But then, as a kid I never could understand why anyone lived on Elm Street. Of the actors, well, it’s all about Jamie Lee really isn’t it. She must feel locked in some kind of lifelong career battle with Carpenter and Hill’s character. It’s not entirely unfeasible at this time to consider the possibility of her return in a further twenty years, defending three generations of her family in her eightieth year. You heard it here, er, probably not first. Anyway, Curtis is Strode and Strode is Curtis and time ain’t going to change that. Otherwise, Haluk Bilginer does some good work as the new Loomis, Dr. Sartain, just Pleasance enough without imitating. The two podcasters are hilariously over the top earnest and there is an absolute star turn from Jibrail Nantambu as the inevitable babysitter’s young charge. Exuding all the knowledge that his elders should be well versed in now, he’s downright hilarious amongst the carnage. The story can’t quite be bothered to confirm his fate but I’m assuming he got away in the face of no other evidence that I can recall. Finally, Will Patton fills in the requisite local sheriff role, his Officer Hawkins apparently the first on the scene way back when Micheal first got all masky/stabby. Beyond that nobody particularly stands out but we’re not really here for deep characters or Oscar worthy performances are we. We’re here for Laurie, for gruesome despatching, for tension and, most importantly that score. Which still stands up today amongst the best pieces of music ever thrown into a movie. It still gives you chills even now. Chills or a warm, nostalgic glow, I’m not sure which. The only question to answer here is if you’re a fan of the original, will you enjoy this iteration? I’d go a (synth) heavy yes on that one. Also, if you enjoyed H20, you’ll have a ball here, especially if you happen to have a beer or two whilst you’re watching. It’s no masterpiece, the tension is severely limited and you could care less about any of the deaths beyond a weird curiosity of how they occur but it is great fun. The filmmakers are filled with ways to praise Carpenter’s original whilst at the same time ruthlessly mocking it’s tameness compared to current times. I happily spent the running time picking out the nods to the past, well, not so much nods as a lobbed severed head at the original and there was enough in the slaying to fill in between the humour. I shall look forward to writing the review of H60, by which point I’ll be H61. Ouch.